The Task Force’s Advocacy and Action team identifies and takes action on advocacy opportunities to advance full freedom, justice, equality AND equity for LGBTQ people. We seek to achieve this by Queering the Progressive movement and strategically galvanizing and mobilizing the LGBTQ community and LGBTQ allies at places of intersectionality. L-R: Barbara Satin, Victoria Kim, Bridget Schaaff, Esq. and Victoria M. Rodríguez-Roldán, J.D. 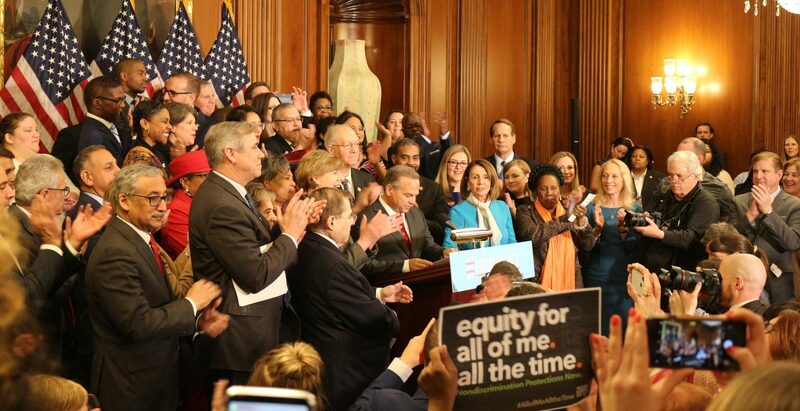 at the Equality Act Introduction, on Wednesday, March 13, 2019. The National LGBTQ Task Force educates federal policymakers about the need for non-discrimination protections that ensure the whole person is able to advocate for themselves when discriminated against, wherever that discrimination takes place. We work with a wide range of progressive partner organizations across the country both at the state and federal level. At the National LGBTQ Task Force, we recognize that everyone has a fundamental right to sexual health and bodily autonomy, which includes the right to decide whether or when to become a parent, to parent the children we have, and to do so with dignity and free from violence and discrimination. We support the reproductive health, rights, and justice (“repro*”) movements because LGBTQ people need access to reproductive healthcare and services such as abortion, HIV care, and family planning. Yet we continue to face pervasive and government-sanctioned discrimination designed to block recognition of our relationships and hinder our ability to form and protect our families.